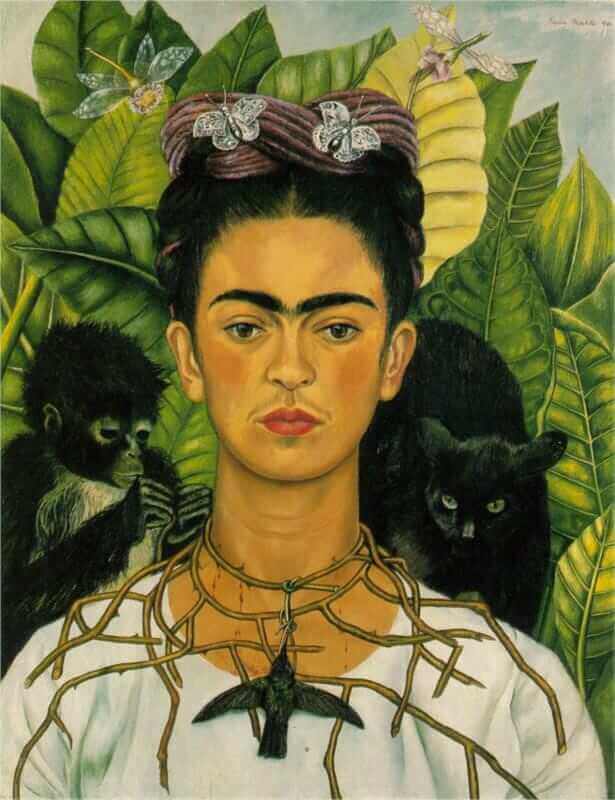 This painting, Self-Portrait with Thorn Necklace and Hummingbird, was painted by Frida Kahlo in 1940. Although this painting has a small size (about 16x24), it draws lots of interests, since it contains so many aspects which are symbolic to Frida Kahlo. In this portrait, Frida Kahlo faces the viewer with background of large green leaves and a yellow leaf right behind her. The thorns are around her neck like a necklace which is held by a black monkey. Her neck is bleeding from the piercing thorns. On right side behind her shoulder is a black cat. A humming bird is hanging on the thorn which knots around her throat. Her expression is calm and solemn. It also seems she is patiently enduring the pain. Frida Kahlo put so many symbolic creatures in this painting. She was not painting a realistic scene but using these symbolic elements to express her feelings. A bird is often symbolize freedom and life. Especially hummingbird which is colorful and always hovering above flowers. But in this painting the humming bird is black and lifeless. This might be a symbol of Frida herself. Frida spent most of her life in physical pain after the bus accident happened when she was eighteen. After that she endured about thirty-five operations to fix her body. She spent so many years bedridden and cannot bear any children. This is a painting about her suffering.